Hello everyone! 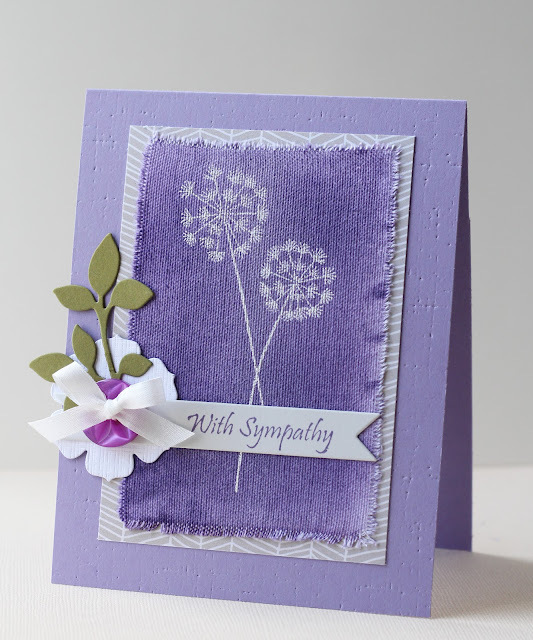 Today is my very first Great Impressions Stamps blog post, and I'm sure excited to share my card with you. I used one of my favorite techniques: emboss resist on canvas. To create the embossed panel, I stamped the dandelion image onto sticky back canvas using VersaMark ink, then poured white embossing powder onto the image. I heat set the embossing powder, then used distress inks and a blending tool to ink the canvas. At this point the canvas looks really blotchy and uneven, but don't worry! After I applied the ink, I sprayed the canvas with pearlized water (perfect pearls + water) liberally, then let it dry. When the ink/water has dried, it is a gorgeous shimmery purple! The shimmer is hard to see in the photo, but in real life it is beautiful. I frayed the edges of the canvas before adhering it to a piece of patterned paper. The stamps I used are Seeded Dandelions G298 and With Sympathy B178. Wow Erin! Your card is stunning! Like the pop of color from the button and leaves, Erin! Pretty card! Love your mixture of textures and purple colors. Will have to try the canvas, it looks charming!